Holiday trading led to a subdued last week of activity in the FX markets for 2015. The decline in volumes last week was far from surprising given that the week was book-ended by both Christmas and New Year’s Day. Nonetheless, the subdued activity wasn’t enough to keep the overall volumes for December down. Thanks to the Fed’s first rate hike since 2006, the first half of December was one of the most active periods of FX trading in all of 2015 since the Swiss franc move last January. After a light November that saw many traders on the sidelines as they awaited action from the Fed, December didn’t fail to reignite the market. 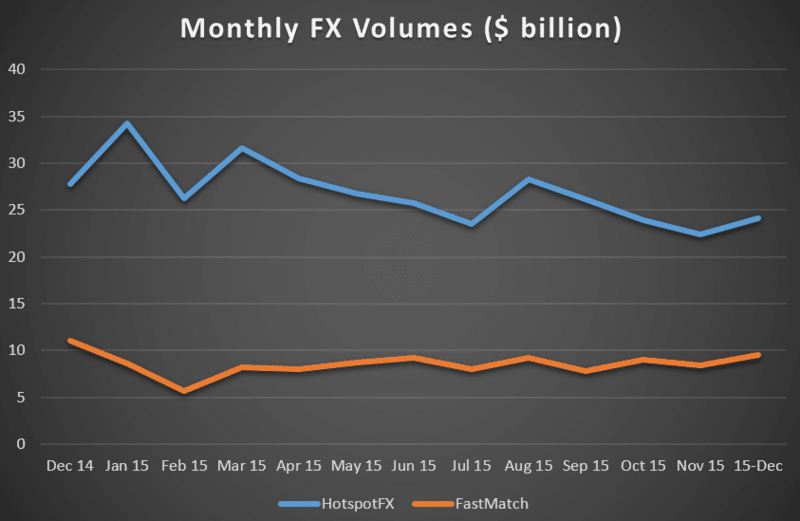 Among publicly reporting FX ECNs, Hotspot and Fastmatch both recorded month over month increases in volumes during December. For Hotspot, average daily volumes (ADV) at the trading venue were 24.1 billion, 7.6% above November and bucked what had been three straight months of falling volumes. However, the month was still 13.2% below the same time in 2014, thus revealing that Hotspot still has room to rebound after hitting multi-year monthly trading lows in November 2014. At Fastmatch, December’s activity was even rosier, with ADV of $9.5 billion for the month. The figure was 13.1% above November. Although 13.6% below the same period in 2014, that month was immediately prior to the January 2015 Swiss franc volatility that hit Fastmatch especially hard due in part to having an ownership connection with embattled broker FXCM. However, Fastmatch appears to be nearing a rebound to their 2014 levels, with December’s ADV the highest for 2015. Trading on December 3rd on the day of the Fed’s rate hike hit over $20 billion, for the first time since January 15th 2015. Also, with 11 days of trading above $10 billion, it was the only month of the year where the majority of trading days broke the $10 billion barrier.